Mario may be known for his background as a plumber, or his recent adventure as a body-snatching fashionista, but over the years he’s also become one of gaming’s most popular athletes. With Mario’s newest tennis iteration launching later this year for the Nintendo Switch, it’s the perfect time to look back on the many games that preceded it. Like other classic Nintendo franchises, Mario sports has become a staple of each console and handheld library. While it seems like Mario’s athletic glory days are behind him, through the good, the bad, and the painfully mediocre there have always been moments and modes that have stuck with players. This piece originally appeared 5/16/18. We’ve bumped it today for the release of Mario Tennis Aces. Over the past two decades, 27 games have featured Mario playing sports. What started as a handful of country club favorites has expanded to nearly every sport under the sun. Mario has golfed underwater, played soccer in deep space, and dunked on classic Final Fantasy monsters, all with his trademark pep and determination. At its height, Mario sports mixed dependable mechanics with unique Mushroom Kingdom flair. Mario sports games oozed charm and kept players of all ages coming back. Recently, though, the series has been gradually sliding into a murky puddle of mediocrity, with one unfulfilling release after another. Before we get into the turbulent history behind one of Nintendo’s most beloved sports franchises, it should be noted that the highly successful Mario Kart spin-off is not considered a part of the Mario sports series. Yes, racing is a sport, but the Mario Kart games have blazed their own critically-acclaimed path, with Nintendo taking full command. As you’ll see, Mario sports is a series that Nintendo tends to entrust to others. Though some purists might say that 1985’s Golf for the NES is the true start of the Mario sports series, there is little official Nintendo literature that agrees with this sentiment. While the western box art for Golf features a paunchy man with a red shirt and a mustache, the golfer is never referred to as Mario within the game. By the time Nintendo released the Game Boy version of Golf in 1990, Mario had been established as their go-to mascot and his likeness was plastered on the game’s cover to draw in fans. In 1991 Nintendo launched another golf game, dubbed NES Open Tournament Golf. This time Mario officially took center stage, donning American flag-styled golf attire to hit the links across the world. Luigi was also a playable character, Princesses Peach and Daisy acted as caddies, and Toad appeared to flag down players who had chipped their ball too far off course. In what was likely the strangest appearance, Donkey Kong reared his ugly head as Mario’s bookie and accountant. NES Open Tournament Golf was significant in terms of up-and-coming talent within Nintendo. It was the first project for renowned Zelda producer Eiji Aonuma, who designed the in-game sprites. Independent development studio HAL Laboratory, known for their involvement in Nintendo series such as Kirby and EarthBound, was also integral in cramming as much content as possible into NES Open’s tiny memory space. Leading the way in his first role as a designer was Satoru Iwata, who would go on to become the fourth president of Nintendo. Through the 90s, Mario got involved in new areas of the quickly expanding gaming world. The portly plumber was soon teaching preschool basics, typing, and history, as well as giving players a creative outlet with Mario Paint for the Super NES. With Nintendo planning to launch their “revolutionary” new handheld the Virtual Boy in the fall of 1995, the company’s number one research and development team, led by Game Boy creator Gunpei Yokoi, began work on Mario’s next athletic outing—Mario’s Tennis. It appeared tennis was the best sport to showcase the stereoscopic 3D depth of the Virtual Boy. Mario’s Tennis, initially announced as Mario’s Dream Tennis, launched alongside the ill-fated console and was bundled in with the bulky VR nightmare upon its launch in North America. While Mario’s Tennis impressed a fair share of players and critics with its red and black 3D visuals, many others found the gameplay, audio, and content to be severely lacking. The game’s tiny roster of seven characters (smaller than even Super Mario Kart), coupled with its repetitive modes and settings didn’t do much to keep players entertained for long. When Nintendo’s headache machine failed to sell, the company decided to cancel the system’s upcoming link cable, completely negating all of the multiplayer capabilities built into Mario’s Tennis. After a year of dismal sales and lackluster games, the Virtual Boy was put out to pasture, taking Mario’s first tennis excursion along with it. As the Virtual Boy exited the scene, Nintendo shoved their new Nintendo 64 home console into the spotlight. Sony’s PlayStation, a new contender in the ever-fluctuating console wars of the mid 90s, already had a year-long head start on the fledgling 64-bit system. As the next few years went by, PlayStation took a more commanding lead, with nearly double the number of consumers picking Sony’s disc-based console over the N64. Mario had once again proven to be Nintendo’s most popular and profitable franchise, with hits such as Super Mario 64 and Mario Kart 64 selling upwards of nine millions copies. The road to success was clear—Nintendo needed more Mario. While Nintendo decided to turn over their new Mario Party franchise to the developers at Hudson Soft, they handed their Mario sports titles to the team at Camelot Software Planning. Camelot, originally founded as a division of Sega in 1990, was well known for their longrunning Shining RPG series. The studio’s only other claim to fame was their PlayStation sports game Everyone’s Golf. When Camelot officially broke ties with Sega in 1998, it decided to jump in bed with the enemy, offering its services to Sega’s former bitter rival Nintendo. The result of this new partnership was the start of Mario sports’ modern era. Nintendo commissioned Camelot to develop four new sports titles to be released for the Nintendo 64 and Game Boy Color over a span of three years. Mario Golf launched on the Nintendo 64 in the summer of 1999, marking Camelot’s first Nintendo title and introducing a new generation of players to the subtle victories and annoyances of golf with a colorful Mushroom Kingdom coating. A little more than a year later Nintendo and Camelot released their next 64-bit entry, Mario Tennis. Nearly every aspect of the game was modeled around improving the faults in Mario’s previous ho-hum tennis experience, including a stellar multiplayer mode for up to four characters. Most importantly, Mario Tennis introduced one of gaming’s greatest anti-heroes, the gangly and unpleasant Waluigi. With his trademark shouts of “Wah!” and his displays of bizarre athleticism, the elfish villain soon gained a cult following that continues to this day. Both of the Nintendo 64 games were lauded as fantastic additions to the console’s somewhat sparse library. Mario Golf and Mario Tennis also launched for the Game Boy Color at the end of 2000 and the start of 2001 respectively. Though similar to the console versions in basic gameplay, both of the handheld versions featured one monumental difference—RPG elements. Camelot provided players with a story mode featuring humanoid characters not seen in the console version of Tennis and Golf, such as Kid, Sherry, Putts, and Grace. As the storyline progressed the characters gained experience points and levels, allowing players to tweak their abilities and boost their stats. It was a welcome twist to the average preset and unwavering character skills that their counterparts and most sports games at the time included. Mario Tennis and Mario Golf did well enough on Game Boy Color that Nintendo elected to take things a step further in their own backyard. In the spring of 2001 Nintendo released the Japan-exclusive Mobile Golf, an upgraded version of Mario Golf that could be played online using the Mobile Game Boy Adapter. Though the Game Boy cell phone adapter was eventually considered a flop, Mobile Golf became Mario’s first official online sports spectacle. Now that the foundation had been set, Nintendo encouraged Camelot to begin building the next wave of Mario sports titles for their upcoming GameCube and Game Boy Advance systems. These entries needed to be a step up in terms of graphics and gameplay that would please series fans and bring in new players. Nintendo had trailed Sony considerably in the last console generation, and now Microsoft had also thrown their hat into the ring with the Xbox. They needed a catalog of must-play games that could give them an edge on their competition. Mario Golf: Toadstool Tour launched for the GameCube in July 2003, the first Mario sports game for the platform. The golf gameplay was similar to previous Mario Golf games, but Toadstool Tour was brimming with detailed environments and creative multiplayer modes. The game’s visually improved courses were now adorned with blatant references to Mario baddies and landmarks, even throwing in a few mischievous Pikmin hiding within flower patches. Instead of average-looking courses, Mario and friends could now tee off in the fiery fields of Bowser Badlands or Donkey Kong’s lush Kongo Jungle. Toadstool Tour made the most of local multiplayer with modes like Ring Shot and Coin Shoot, which tasked players with collecting rings or coins by placing their shots just so on the way to the green. Another popular party option was the risky Club Slot mode, which forced players to use a random new golf club on each new approach. Mario Power Tennis, first seen in 2002 issue of Nintendo Power magazine, came to the GameCube in 2004. The game featured new “Power Shots” that allowed characters to either hit a nearby ball with a special swing or return a ball that was out of reach. Each character had their own personalized moves, including fireballs, vacuums, cannons, and whatever the hell it is that Waluigi does. Unlike Toadstool Tour, Power Tennis felt like a full step up in terms of basic gameplay and the personalized Power Shots added to the over-the-top Mario madness. Both games would go on to surpass a million copies sold. When asked by IGN why neither of their GameCube games had included the well-received RPG aspects of their Game Boy Color predecessors, Camelot president Hiroyuki Takahashi said Camelot didn’t feel it would be a good fit for a console with so much multiplayer potential. The Game Boy Advance, on the other hand, was a handheld platform where single player was still king. While wrapping up Toadstool Tour and Power Tennis, Camelot began planning their next mobile offerings in each sport, making sure to once again bring an in-depth story mode to the forefront. The Game Boy Advance had been out for nearly three years when Mario Golf: Advance Tour hit stores shelves in the spring of 2004. The game, arguably the best Mario sports title in existence, brimmed with features, characters, and an RPG feel superior to what had been on the Game Boy. The game’s box even touted it as being “Role Playing Golf.” Though the GBA couldn’t produce visuals half as well as its home console sibling, Advance Tour still looked the part with fluid pseudo-3D graphics and vibrant scenery. To top it all off, Advance Tour could actually connect with Toadstool Tour using a special link cable. Similar connectivity had been used with the Nintendo 64’s Transfer Pak, but Camelot was determined to make it a much more worthwhile undertaking this time around. Players could build up their character’s stats and clubs on the go and then transfer them all to the big screen when they arrived home. It was a novel idea that Advanced Tour and Toadstool Tour executed with aplomb. The following year Nintendo published Mario Tennis: Power Tour to great acclaim. Camelot had once again done a tremendous job of compacting all the content usually found in a home console into one miniature GBA cartridge. Like Advance Tour and its Game Boy brethren before it, Power Tour had a heaping helping of role-playing undertones. Players could improve their character as they progressed through the game’s Royal Tennis Academy by winning tournaments, defeating opponents in challenges, and playing training mini-games. Power Tour even allowed players to earn and upgrade more than 40 different power shots, which they could equip for various playstyles. Oddly enough, the game didn’t feature any connectivity to Power Tennis on the GameCube. As the the sixth console generation came to a close, Nintendo decided it was time to expand Mario’s sporting repertoire. In 2005, famed publisher EA approached Nintendo about adding Mario, Luigi and Princess Peach into some of their critically acclaimed sports titles. Nintendo gave the thumbs up, and the three heroes appeared in the GameCube exclusive versions of SSX On Tour and NBA Street V3. Mario and crew’s cartoon aesthetics didn’t exactly mesh with the more realistic visuals found within the games, but that just added to the novelty of it all. Watching Luigi throw down a rim-shaking dunk over Lebron James was a surreal and gratifying sight. The Namco-developed Mario Superstar Baseball for the GameCube was the first true Mario sports title after EA’s Mario experiment, dropping in the summer of 2005. Players mostly liked it, concluding that Mario’s first take on baseball was less of a grand slam and more of an inside-the-park homerun (which is still pretty good). A soccer title, helmed by the then up-and-coming Next Level Games, was next on the docket. The result, Super Mario Strikers (known as Mario Smash Football in Europe), surprised many with its accessible multiplayer and overly-aggressive attitude. Toad scowled. Princess Peach slide-tackled opponents into mud splattered walls. Both games were solid entries in what would be the GameCube’s final year as Nintendo’s main home console. Nintendo’s next console, the Wii, was considered a hot commodity. And with every Wii (at least in most regions) came Wii Sports, a collection of five sports games. One might think Nintendo would prefer to have a sports title featuring their famous mascot Mario, but the Wii was all about putting players inside the game. Instead of Mario or Yoshi, players could customize their own Mii character to play as. The sports involved—tennis, baseball, golf, bowling, and boxing—didn’t have the unique settings or graphical polish of Mario sports games, but they didn’t need to. Motion controls were the star of the show. With Wii Sports leading the charge, Nintendo put Mario’s most famous athletic offerings, tennis and golf, on the back burner. It would be seven years before a new entry in either would see the light of day. Instead, Nintendo opted to throw Mario into some new sporting events. The first (and last) Mario sports title exclusive to the Nintendo DS was 2006’s Mario Hoops 3-on-3, a title that was developed by Square Enix. Like Camelot before it, Square Enix was known for creating stellar RPG adventures, most notably the Final Fantasy and Dragon Quest series. A Mario basketball title seemed like a far cry from their usual wheelhouse. Square Enix worked some of their classic Final Fantasy characters into the mix, creating one of the oddest line-ups in any Mario sports game to date. 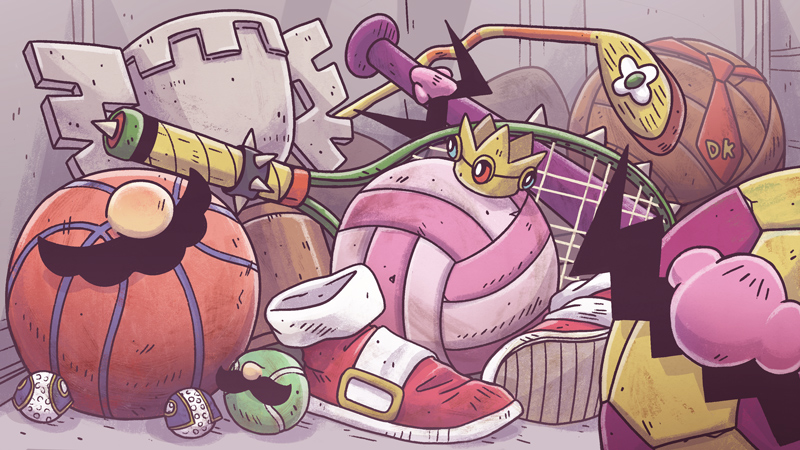 While many players found a certain satisfaction in Donkey Kong dunking on a cactuar, Mario Hoops’ simple AI opponents, clumsy controls, and lack of online play left many DS owners disappointed. Mario’s sporting premiere on the Wii was 2007’s Mario Strikers Charged, a follow-up to the well-received soccer showdown released just two years earlier on the GameCube. It was a welcome addition to a console library already drowning in shovelware, even though many found the gameplay all-too-familiar and quite a few of the motion controls (like many Wii titles) tacked on. But Charged was hardly Nintendo’s biggest sports reveal for 2007. Since Sega’s transition to third-party developer in 2001, the former console competitor had grown close with Nintendo, even helping with F-Zero. Mario and Sonic, long time rivals and the flagship mascots of their respective gaming companies, were finally going to settle things—at the Olympics. Like many Wii and DS games of the time, Mario and Sonic at the Olympic Games was presented as a touch or motion controlled mini-game collection. Players could shake, trace, and twist their way to victory in a number of classic Olympic events as various Mario and Sonic characters. Some aspects of the game kept players coming back for more, but not every event worked well. Jumping events tended to be too finicky with their percises movement requirements, and longer races forced players to painstakingly pace their Wiimote waggling to keep their runner from overheating. Mario sports was becoming less of a well-crafted single-player experience and more of a party trick for Nintendo to show off its hardware. And Nevertheless, with combined sales of Mario and Sonic’s home console and handheld versions surpassing 10 million copies, Nintendo and Sega agreed to bring the duo to every summer and winter Olympics over the next nine years. Camelot finally came back on the scene to help Nintendo with a port of Mario Power Tennis for the Wii in 2009. The game was part of Nintendo’s “New Play Control” series, which focused on introducing motion controls into GameCube classics such as Pikmin and Donkey Kong Jungle Beat. With hardly any new content and a host of motion-reading issues, the new version of Power Tennis was a step backwards for the prominent GameCube classic. In 2011, as the Wii’s last hurrah in the Mario sports arena, Nintendo teamed once more with Square Enix to produce Mario Sports Mix. Taking cues from Mario and Sonic, Sports Mix aimed to offer players multiple different athletics to choose from. Basketball, hockey, volleyball, and dodgeball were all included, each with its own special modes and moves. The game’s barebones content and poorly-executed controls were the epitome of what the long-running Nintendo series had become over the last few years: a shiny but vapid shell of its former self. It had become a series with little depth and gameplay that even a child, the series’ main audience, would find repetitive. It wasn’t long until Camelot announced a new Mario Tennis for the 3DS. This time there would be no faulty motion controls or unnecessary fluff. Fans of past portable Mario Tennis titles were hopeful that Camelot would incorporate the tried-and-true RPG elements the series was known for into the new game. Unfortunately, 2012’s Mario Tennis Open failed to impress most players. The game’s minimal RPG management involved upgradeable rackets and gear, feeling muddled. Worse still, it was an aspect of the game that could only be applied to Mii characters, not classic Mario allies and baddies. Though players enjoyed the game’s home console feel and presentation, they weren’t so keen on the newly introduced twist called “Chance Shots.” These glowing colored circles let players return shots with more power and accuracy if they hit the ball with the proper swing (slice, lob, smash, etc.). Though chance shots improved the regular gameplay, they also made things easier, as players could see exactly where a ball would be going as soon as their opponent sent it hurtling their way. Overall, the game was hardly the return to form fans had been hoping for. In 2014, 10 years after their last Mario Golf entry, Camelot and Nintendo announced a new portable golf adventure for the 3DS. More exciting than its simple existence was the fact that the game, Mario Golf: World Tour, was actually the best Mario sports game in a fair amount of time. Though it kept Mario Tennis Open’s focus on Mii characters, World Tour did a much better job of giving 3DS owners a rewarding single-player experience. World Tour is possibly the most “Mario” of the Mario Golf games to date, with shiny coin collecting modes and a well-executed power-up system adding to the mix of solid golf mechanics and colorful courses. Online tournaments, bizarre but enjoyable gear like Bullet Bill chipping wedges and spiked Bowser gloves, and follow-up DLC gave many long-time players hope that the series was returning to its GameCube and Game Boy Advance roots. Outside Mario and Sonic’s Olympic offerings, Nintendo’s struggling Wii U home console, which launched in 2012, hadn’t seen much love from Mario sports. That all changed in 2015 with the release of Mario Tennis: Ultra Smash. While Mario Tennis Open had been a little lackluster in its roster and overall modes, Ultra Smash was a disaster. To begin with, Mario and pals were limited to only one stadium for every match, unlike previous entries where players could pick from a variety of regular and Mario-themed venues. The game’s new “Ultra Smash” gimmick was virtually identical to the “Chance Shots” featured in Open, which led to players simply running from spot to spot instead of strategizing their next move. Mega Mushrooms were added to the game to give players a temporary boost of speed and power, but they often resulted in blocked views and cumbersome swings. Ultra Smash was an ultra let down. In 2017, Camelot, with the help of Namco, took a swing at the multi-sport formula with Mario Sports Superstars for the 3DS. The game featured four of the world’s most popular sports, baseball, soccer, tennis, and golf, as well as… horse racing? Ok, sure. While Ultra Smash had been the first Nintendo sports title to use amiibo, Nintendo’s tiny statues, Superstars launched with its own line of amiibo cards, which could be used to unlock “superstar” versions of each character in a more timely fashion. The tennis and golf sections of the games were very reminiscent of both Mario Tennis Open and Mario Golf: World Tour in their reliable gameplay. The three other sports served up by Superstars were also decently well-designed representations of their real life components. But Superstars didn’t have any power-ups, special moves, or baseball stadiums set in a volcano like past entries. It was a modest sports title that could hold one’s attention for a while, but it lacked the Mario magic that made the series worth playing. As of 2018, Mario sports has stagnated. They’re stuck in a rut and lack substance and personality, something they were well-known for 15 years prior. Nintendo’s next Mario sports game is on its successful, new console, The Switch. Mario Tennis Aces was announced in a Nintendo Direct this past January and looks to be a giant step forward for the series. Aside from looking gorgeous, the game has done away with the predictable “Chance Shots” in favor of some new tennis razzle dazzle. Players will no longer know where the ball is going to land (aside from lob shots, which is a series norm) and will have to use new abilities such the trick shot to build up a new power meter. With this meter players can decided to go for a powerful “Zone Shot” or slow down time with some “Zone Speed.” Both have their advantages and disadvantages in normal gameplay, potentially giving Switch owners a much more strategic approach to tennis than most Mario Tennis titles of the past. Aces will also introduce a racket strength system. If a player doesn’t return a Zone Shot just right they’ll be penalized with racket damage and eventually a full-on break. Run out of rackets and it’s game over. Though it has been announced that players can earn new rackets and gear for their favorite characters, Nintendo has not said if managing these items will have any stat-boosting advantages. Since the Switch functions as both a multiplayer console and a dedicated single player handheld, Nintendo is including an adventure mode for players to explore. Little is known about what it entails. Only time will tell if Mario Tennis Aces is Mario sports’ grand return to form, but many players are cautiously optimistic that the Switch title will finally measure up to the series’ sixth generation glory days. And hey, even if Aces doesn’t quite live up to the hype, at least we can die happy knowing we finally got to play tennis as a Chain Chomp.